You Can Log In to Your CEU by Net Account! If you use your computer for regular internet browsing, you probably already have COOKIES enabled! If you are having trouble signing in to our site once you have made a purchase, you may need to ENABLE OUR COOKIES. On this page we give you some specific instructions about cookie settings, so that if your computer is NOT accepting our cookies, you can ENABLE OUR COOKIES. What is a COOKIE? State and local government websites and on-line banking use 'cookies'. So does your State licensing board, if it allows you to renew your license on line. It is a bit of computer data created by a website which allows you to log in to your account with a password . . . and may be present so that you can quickly open a certain web page. If you browse the internet, you most likely have many 'cookies' present on your computer for the sites that you frequent the most. The Details of Enabling Cookies . . . Which of These Internet Browsers Are You Using? Please CLICK ON THE LINK BELOW To Go To Instructions For Your Browser! Are you using a firewall? Go here. If you're using Internet Explorer 6.0 . . . If you're using Netscape . . .
AND WHILE YOU ARE IN THIS TASK BOX, go ahead and check the top 3 items above the 'cookie' item so that you can ENABLE pop-ups. This will allow your course study guides to be displayed. AND FINALLY . . . WHILE YOU ARE IN THIS TASK WINDOW, PLEASE CLICK 'INTERNET EXPLORER' in the 'RENDERING ENGINE' box at the bottom of this task box. This will make it possible for these website pages to appear correctly. See the Netscape Settings Screen Shots below. If you're using Mozilla (Firefox) . . . If you're using another browser . 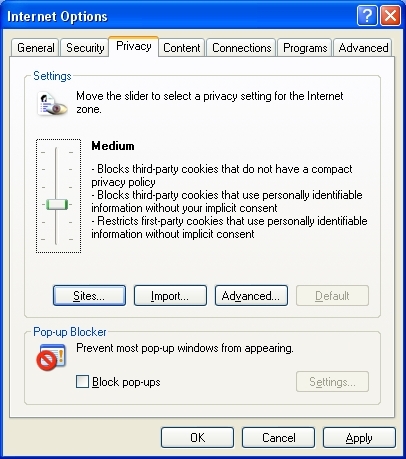 . .
Other browsers and other security software use similar setting options for 'cookies' - the screen shots above will give you a good sense of how to do it, no matter which browser you are using! If in doubt, please check your browser's HELP section. with your user name and password. Cookies and Firewalls . . .
Our materials are presented in a colorful, easy-to-tolerate slide presentation, in a dazzling Macromedia Flash format, with refreshing bluntness, easy-to-absorb bullets, and GREAT humorous clip art! Learn and have some fun at the same time! And best of all . . . it's all automated, over the web, 24/7 - the course materials, the quizzes, the feedback questionnaires, AND the certificates. You will never have to wait for a human to review your quiz and award your certificate! You will never have to fax-and-wait! Middle of the night - weekends - national holidays - whenever. Click here for each state's details, by licensure type. We are open for business 24 hours per day, 365 days per year! Need f-f-f-fast, inexpensive Continuing Education (CE) credits in behavioral health? Need those credits today? No time to mail off for courses or attend a seminar? Need your CE certificate IMMEDIATELY after completion of your course? No time to play 'fax-and-wait' for someone to score your quiz and send CE confirmation? Want flexible choices in number of CE units earned - from 1 (0.1) to 10 (1.0)? Like the economical price of a 'course', but want to save some of the CE units for 'later'? Just hate those dull and pedantic online 'Word document' CE courses that sound like Graduate School 101? Looking for something that is colorful, fast-paced, with GREAT clip art and some humor?